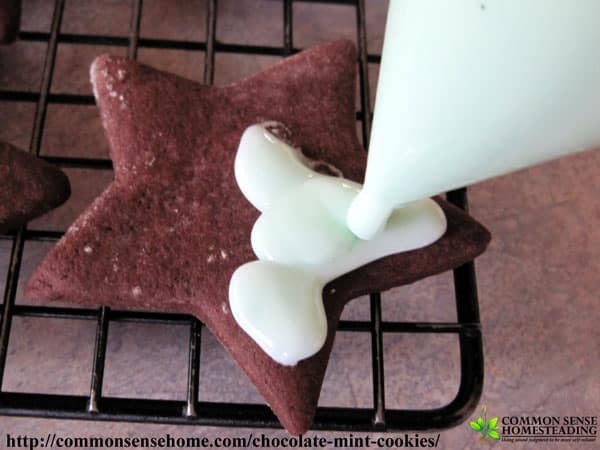 I started making these chocolate mint cookies over a decade ago, and they've become one of the boys favorite holiday treats. 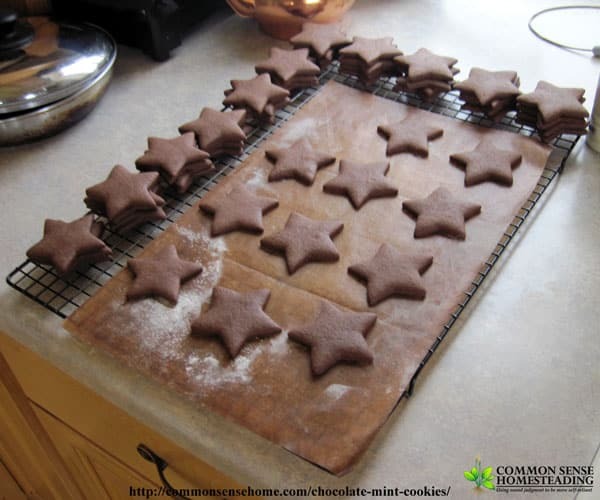 I like to use a star shaped cookie cutter to dress them up a little, but you could use any cookie cutter shape you like, or even a round glass. 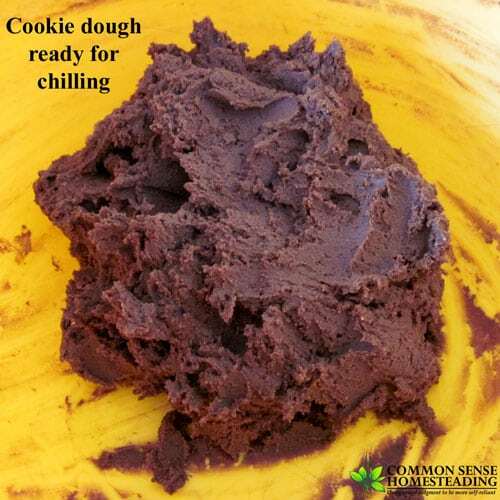 Chilling is required to make the dough easier to work with, as it is a very tender dough. When I'm in cookie baking mode, I like to mix up several types of dough one day, refrigerate overnight, and then do all the baking and decorating the next day. To make the cookies: In a large bowl, cream butter and sugar until light and fluffy. Beat in egg and vanilla. In a medium bowl, combine the flour, cocoa, baking powder, baking soda and salt; gradually add to creamed mixture alternately with milk, beating well after each addition. 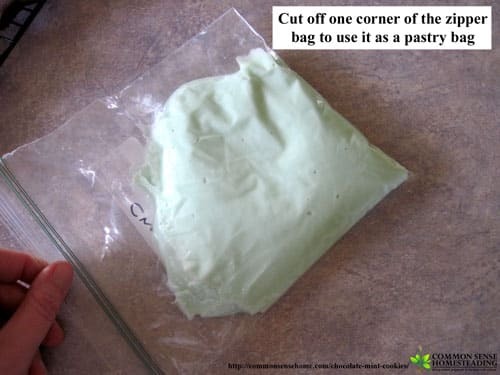 Wrap finished dough in plastic wrap or place in sealed contain and refrigerate overnight. Unwrap dough and roll out 1/8-in thick on parchment paper or reusable parchment paper. 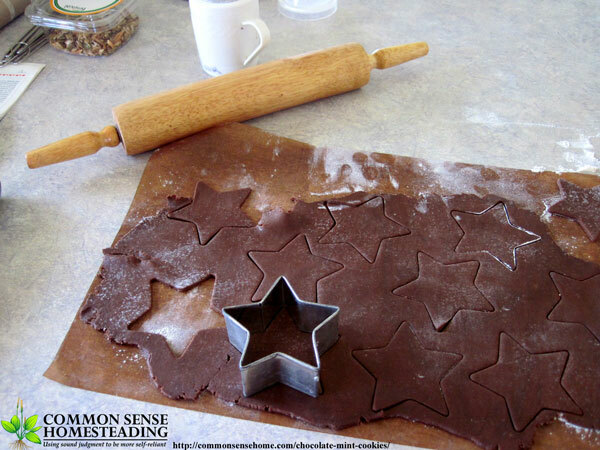 Cut shapes with star cutter or cookie cutter of choice, making sure to leave a gap of at least 1/4 inch (1 cm) between cookies, as they will grow slightly during baking. Bake at 325° for 9-11 minutes or until edges are set. Place on wire racks to cool. I really like my big 14.5″x20″ grid cooling rack, as it is large enough to hold an entire pan of cookies plus additional cooled cookies around the edges. To make the filling: In a small bowl, combine confectioners' sugar, butter, milk extract and food coloring (if desired); beat until smooth. Spread icing on half of the cookies; top with remaining cookies. 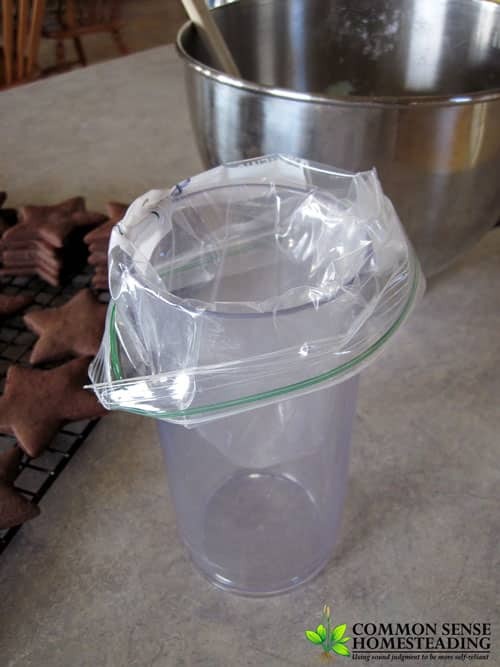 I like to fill a ziplock bag by placing it in a large glass, and then nip off a corner of the bag to use it as a decorating tube. Yield: 6-7 dozen cookies, depending on the size of your cookie cutter. 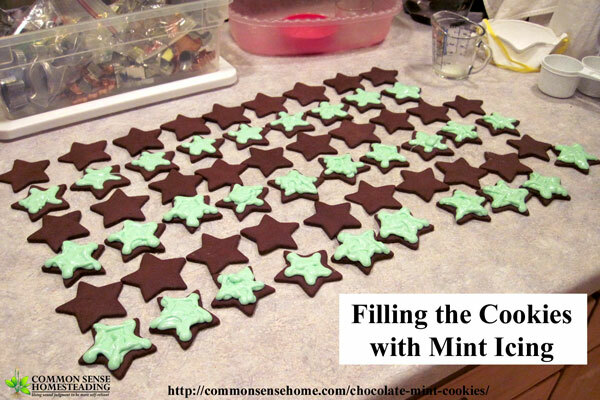 Skip the filling – If you want to save a step and are happy with a chocolate mint wafer cookie instead of a chocolate mint sandwich cookie, skip the filling and instead add 1/2 teaspoon of mint extract to the dough along with the vanilla extract. teaspoons of coconut oil. Dip half of each cooled cookie into melted chocolate. Place on waxed paper until chocolate is set. 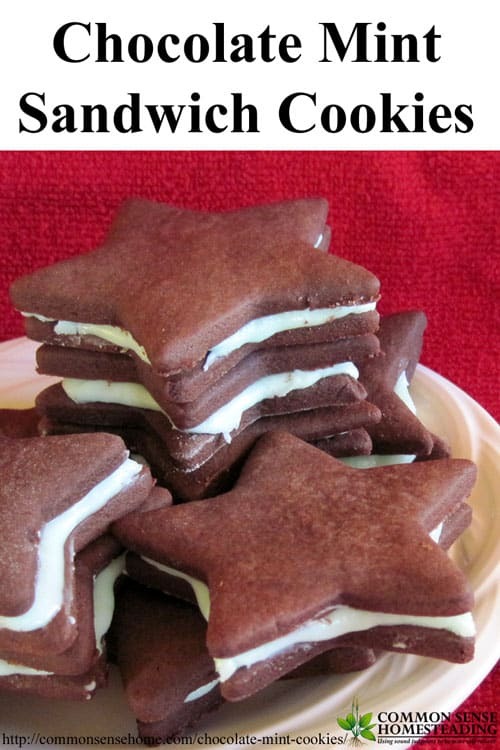 This would probably work best with just the chocolate mint wafer cookies, but if you're feeling bold you could try it with the chocolate mint sandwich cookies. Oreo™-style cookies – If you'd like the extra dark look of Oreo™ cookies, use a Black Dutch Processed Cocoa powder. The cookies in the photos were made with organic cocoa powder. Every Christmas season, my mom, my sister and I would bake crazy amounts of cookies to share with the extended family, plus a big gingerbread creation – houses, barns, churches, Santa's Workshop, log cabins – you name it, it probably came out of mom's kitchen over the years. Bon bon cookies were one of my own personal favorites, but my family was less enthusiastic, so I haven't made them in years. Neapolitan cookies, sugar cookies, starlight mint surprise cookies, stained glass cookies, spritz cookies – I wish I had taken more pictures back in the day, as I can't remember all of them anymore. Maybe my siblings will chime in when they read this post? After moving to the other side of the state, I didn't get in on the baking parties as often, but I still do some baking with my boys. Now there are some less sweet options in the mix, like coconut macaroons and Homemade Mounds or Almond Joy Bars with Coconut Oil. There's still a satisfaction in turning basic pantry ingredients into tasty treats that can't be matched by opening a tube of pre-made dough, and I think that's the most important thing to pass down from generation to generation. Do you have a favorite holiday baking tradition? I'd love to hear about it. Tender chocolate cookies wrapped around a light peppermint filling. Unwrap dough and roll out 1/8-in thick on parchment paper or reusable parchment paper. Cut shapes with cutter of choice, making sure to leave a gap of at least 1/4 inch (1 cm) between cookies, as they will grow slightly during baking. Bake at 325° for 9-11 minutes or until edges are set. Place on wire racks to cool. To make the filling: In a small bowl, combine confectioners’ sugar, butter, milk extract and food coloring (if desired); beat until smooth. Spread icing on half of the cookies; top with remaining cookies. teaspoons of coconut oil. Dip half of each cooled cookie into melted chocolate. Place on waxed paper until chocolate is set. 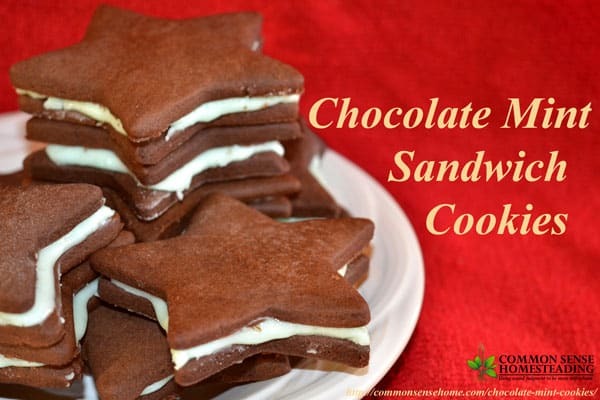 This would probably work best with just the chocolate mint wafer cookies, but if you’re feeling bold you could try it with the chocolate mint sandwich cookies. Your photography is so good that I think I gained a pound just reading the recipe.